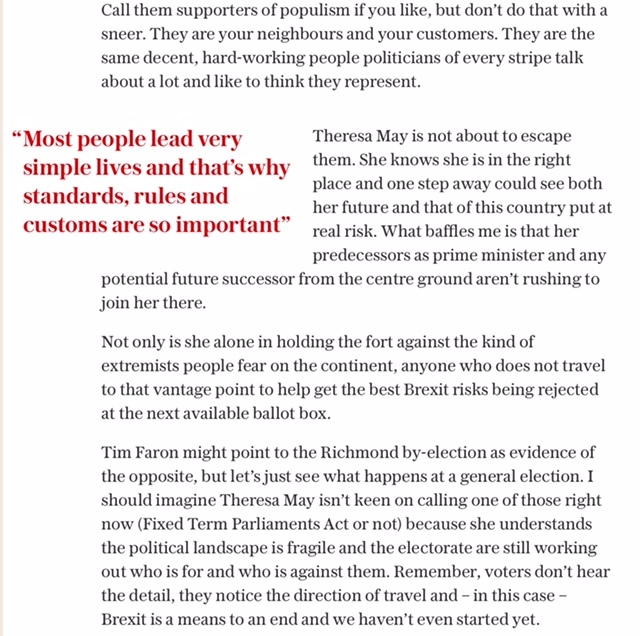 Once Theresa May announced the General Election, and before the Conservative Party Manifesto was published, I wrote a piece for ConHome outlining how I thought voters would approach this election. 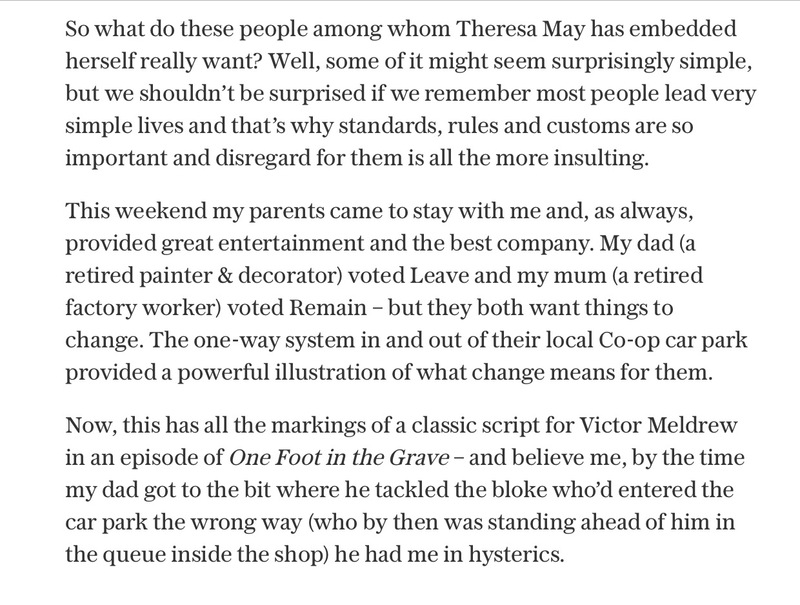 I argued that, because Brexit to ‘ordinary voters’ was less about Europe and more a vehicle for changing the imbalanced and unfair way “the system” works in our country, the basic question voters would ask themselves before putting a cross in the box would be: whose side are you on? In other words, who will deliver the change they want to see happen. To read that piece, click here. After the Conservative Party’s manifesto was published and all hell broke loose about social care, I wrote another piece for ConHome explaining why that policy made such a negative impact on the polls: in short, because it did not fit with the agenda for change of those voters most likely to vote Tory; especially new Tory voters. You can read that piece here. 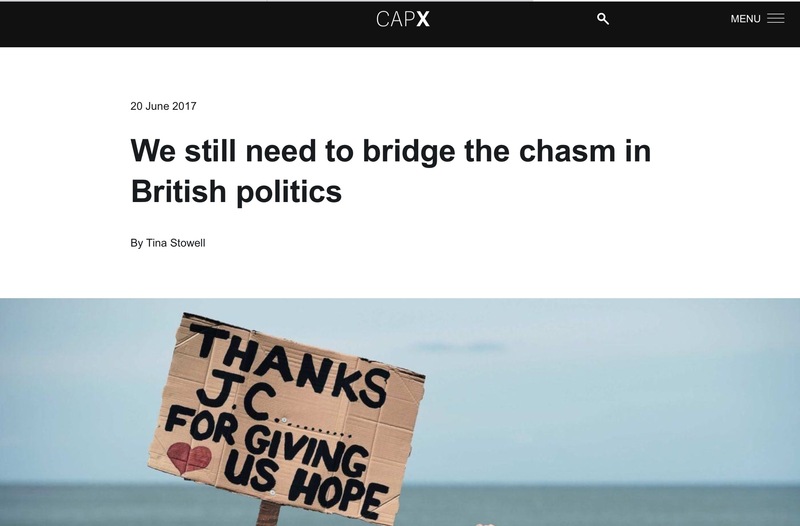 Finally, I wrote a long essay for CapX after the General Election about the chasm between ordinary voters and everyone else in positions of power which Brexit exposed and the General Election did nothing to close. 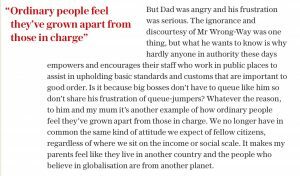 The central point of the essay – as indeed the three other pieces – is that the most important thing we powerful and influential people must recognise is our role in causing the divide and our collective responsibility for closing it. That essay is here. To coin a phrase (which was the most damaging in more ways than one to Theresa May during the election campaign), “nothing has changed”. The divide between us remains as large and as deep as before. 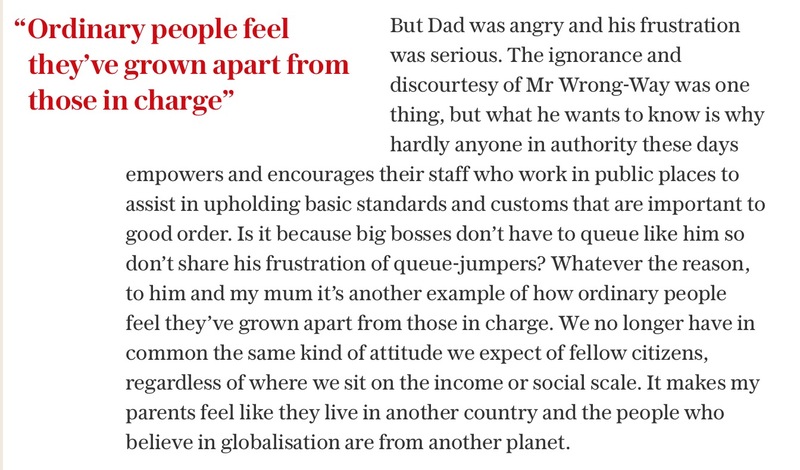 And that is the problem that everyone who enjoys some power or influence needs urgently to do something about. 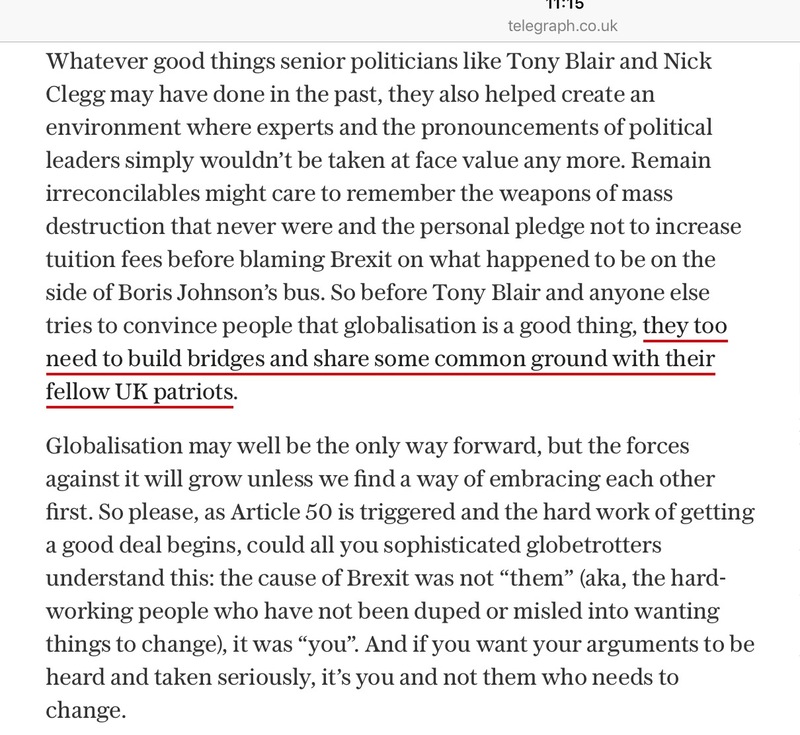 Even after the shock of Brexit, I still don’t think we understand just how badly divided the western world is, how angry some people are, and the risks of us not responding properly to them. 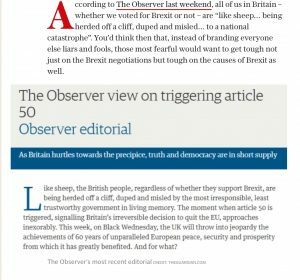 All that jovial talk after the referendum that the Vote Leave campaign was “only meant to blow the bloody doors off” missed the point. 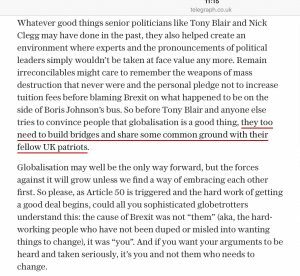 The people who voted ‘Leave’ didn’t want to limit the damage, they really did want to blow everything up – and start again. Over in the USA, they are so angry that they will vote for Donald Trump regardless of what he says or has done in the past because people believe he’s their only hope of blowing everything up. 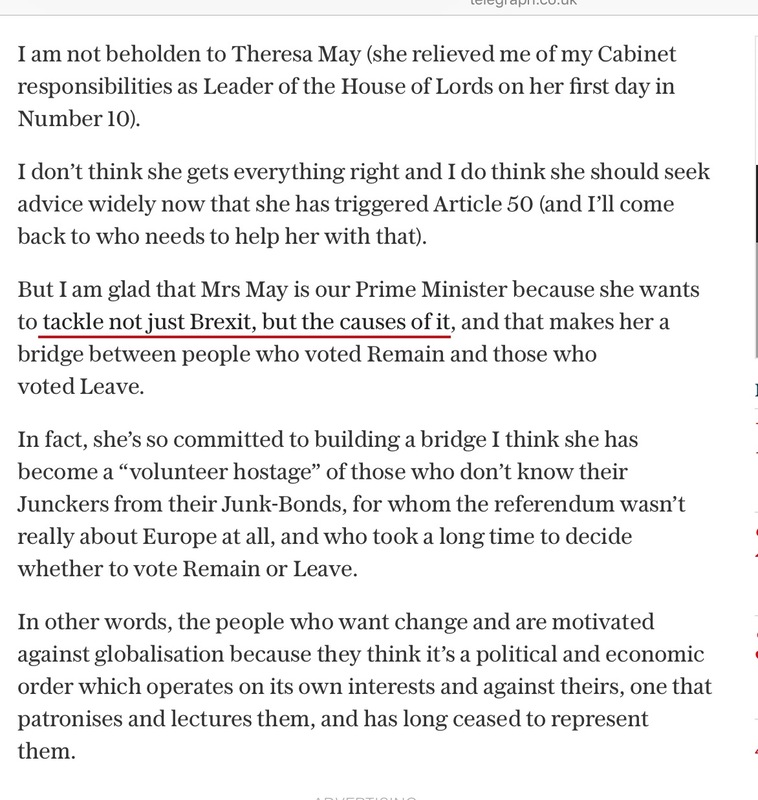 Here Theresa May, an experienced and respected politician, understood immediately what Brexit exposed and responded by promising to change the way our country works when we leave the European Union so it works for everyone. For our new Prime Minister, getting out of the European Union is a means to an end. It is not the end in itself. 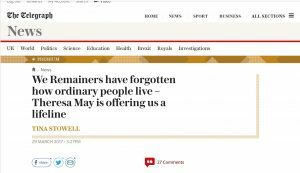 And that’s why Theresa May is right to do nothing that undermines people’s belief in what Brexit means. We should consider ourselves lucky that the people who are angry believe our serious-minded, experienced Prime Minister can deliver for them. I went to the “Women of the Year Awards” a couple of weeks ago where the Prime Minister presented an award to the Hillsborough Women. What happened was fascinating and tells us a lot. Margaret Aspinall, the woman who has been most vocal in the Hillsborough families’ cause, came to the stage to accept and gave Theresa May the most heartfelt embrace, even putting her hand on the back of the Prime Minister’s neck. Margaret Aspinall then said, to a room full of several hundred other women and in front of television cameras, that Theresa May was the first person in power she had ever trusted. Let’s just stop and think about what that cameo tells us. Theresa May can command the trust of people previously let down and therefore has the potential to unite. 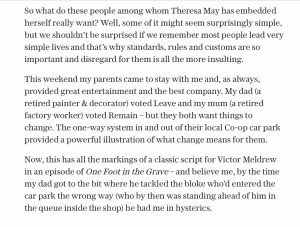 Brexit exposed the massive chasm between those who have been ignored for too long and those who have the power to make change happen. 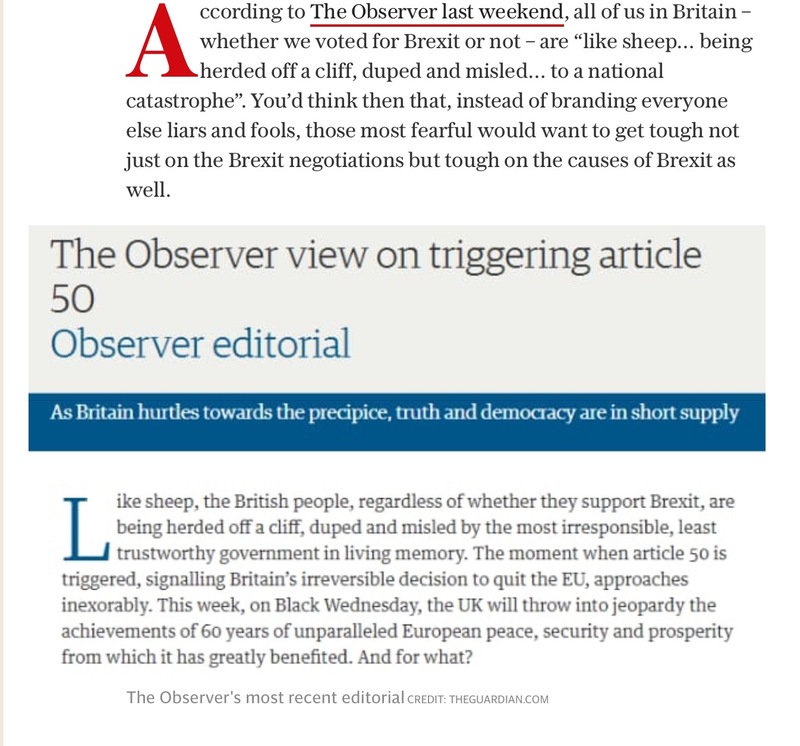 The way I picture it, the people who voted ‘Leave’ are stood on one side pointing to the chasm between us and screaming at the other side for help. And Theresa May has crossed over to them. That’s what the rest of us have got to do. This really is not about politics at all. There’s a mish-mash of parties and a coalition of all sorts of people on both sides of the chasm. Until we’re all on the other side and working together to fix that gap, the one thing I know for sure is that the normal game of politics won’t work. A general election right now would be about politicians and their power to not make change happen. There are many serious business figures, other professionals, experts, MPs and members of the House of Lords who want desperately to get the best Brexit for the whole of the UK and will work tirelessly to achieve that. But the people who need our help don’t believe us anymore. 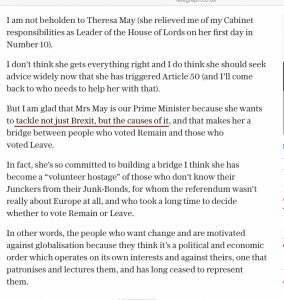 We have all got to follow Theresa. That doesn’t mean people have to vote for her, agree with her, or not challenge her. It means that if we want the people on the other side of the chasm to listen, to take us seriously and believe that we want a country that works for everyone too, we first have to walk over the bridge she has built, or build one of our own, and join them. The judges were doing their job this week and they were doing it as they should. The newspapers were doing their job too. But the reason that judges are judging and newspapers are shouting is because powerful people – in business and politics – are not focusing on the chasm. Instead, they appear to everyone on the other side of the chasm to be focusing on themselves. We have to accept we are coming out of the European Union. We will be triggering Article 50 by the end of March. Two years after that we will be out. I don’t know if that means a Hard Brexit or not, but I do believe the sooner talk of delays, second referendums and Soft Brexits stops, the better Brexit will be for everyone. At an election rally in the US on Friday night Barack Obama told the crowds they have to stay focussed. He said it over and over again. He’s right. But has he and Hillary been focussing on the right thing? We’ll find out on Tuesday night. The whole process of the referendum has changed the order of decision-making and that’s the kind of change – a transfer of power from politicians to the people – that those who voted out were trying to achieve, and even more people now rather like. 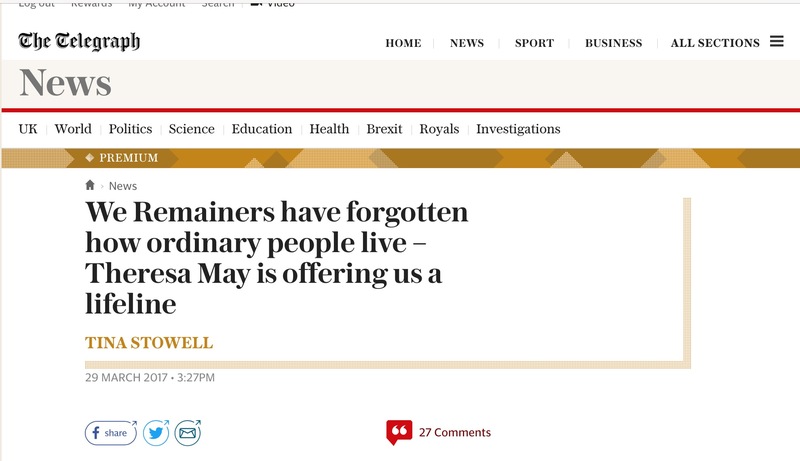 Yes, on 23rd June people voted to leave without knowing precisely what they were getting. But they were clear in their instruction. And, quite properly, they placed responsibility on the politicians to interpret and implement that instruction. Now at the moment we know little more than #brexitmeansbrexit. Businesses in particular are anxious to know more. But I get the feeling the people are content with just the certainty of exit and will remain contented whilst Theresa May keeps taking an orderly and nicely paced step-by-step approach. 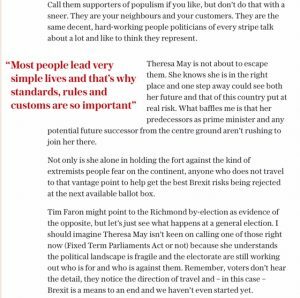 It is true that the Prime Minister and the Government face a massive challenge of getting Brexit right and the risk is they will fail to meet the people’s expectations. 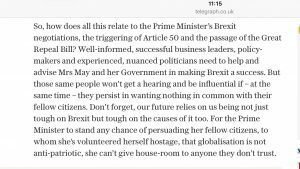 But right now – and until and unless Theresa May fails to succeed, and I think she might well pull it off – the bigger risk sits with the critics. And that’s because the decision to come out was not Theresa May’s, it was the people’s. It’s true that responsibility for how it is done and what is achieved sits with the Government and they will and should be held to account for that. But any comment or criticism that seems to undermine the Government’s enthusiasm for getting this right on behalf of the people will be counter-productive. This tweet from Ed Miliband is just the kind of thing that will grate: it’s mealy-mouthed about what’s likely to be achieved and therefore sounds like he’s criticising the people who voted for out for being stupid. 52% of people voted for #Brexit, but even more people would have voted for a “transfer of power to the people” if that had been on the ballot paper. Yet, in reality and for the moment at least, that’s what it feels like they’ve got and it feels good. So what politicians have to understand is that far more than 52% of people won’t like hearing politicians who can’t get used to the idea of having to take instructions instead of telling us what they want. By all means scrutinise and challenge the Government, but don’t challenge the decision that has been taken to leave and do get behind making it a success.